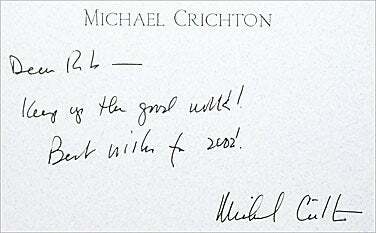 I was deeply saddened to read of the passing of Michael Crichton, at the way-too-young age of 66. Michael was an amazingly talented individual, as evidenced by his background—a Harvard-educated medical doctor who wrote The Andromeda Strain while still in medical school, and then wrote (and directed the movie version of) The Great Train Robbery. From there, his writing career really took off, and he had me hooked at a relatively early age—I remember reading my dad’s copy of The Andromeda Strain in my teen years. While I may not have agreed with all of his recent writing, his books were consistently entertaining, and mixed just enough reality in with some out-there science fiction to get me thinking about the possibilities. Beyond the books, Michael Crichton wrote and directed Westworld (a 1973 movie about humanistic robots running amok at a resort in the future) and Runaway, directed Coma, and co-wrote the screenplays for both Jurassic Park and Twister. While none of these movies will be remembered as Best Picture Oscar winners, I found them all very entertaining—and I still have vivid memories of childhood nightmares featuring the robotic Yul Brynner pursuing the humans through the underground tunnels of Westworld. Finally, as if this wasn’t enough to keep any one person more than busy enough, he also found time to create, write, and produce the long-running TV drama ER. Clearly, Michael’s passing has left a large hole in the entertainment universe. But on a much more personal level, it’s also left a hole in my little corner of that universe. While I never met Michael in person, he and I shared at least one thing in common: a passion for the Mac in general, and OS X in particular. While it’s true that many Mac users could make the same claim, in my case, the connection is a little more personal—and explaining why involves sharing a story that, until today, has remained only within the confines of my immediate family. Eight years ago (on November 4, 2000), I founded (strictly as a hobby) macosxhints.com as a place to collect all these tips I was discovering about the then-very-new Mac OS X. Somewhat surprisingly to me, the site grew very quickly through its first year, and I found myself struggling to pay the ever-increasing hosting bills—I had to change hosting providers two or three times in that timeframe, just to keep my hobby affordable. At the time, the site had no ads, so the only source of income was my paycheck from my day job. Your site is great. Tell me where to send a check. probably get this all the time, but i had to ask ... just in case! ;-)]. useful to you in the future! Why shouldn't you have both a book and a check? To make a somewhat-lengthy story a little bit shorter, it was indeed that Michael Crichton who was interested in supporting the site. A few weeks later, I opened up my mailbox to find a package that contained a check for the site, an autographed copy of Timeline, and the card shown at right. Needless to say, this made not only my day, but my week, my month, and my year. I put the book on my shelf, and whenever I started to feel down about how much of my free time my “hobby” was taking, a quick glance at the bookshelf was all it took to get me going again. Today, seven years on, I still have the book and card, and now, with Michael’s passing, will treasure them more than ever.